Statistics may be against us seeing New Year resolutions through, but make them anyway. We all need a Reset, a fresh start. Make at least a modest change and gain will result, even if you aren’t doing in November what you plan this January. Have you made resolutions for the New Year? Good for you! Though statistics may be against the majority of us seeing them through, make them anyway. We all need a reset from time to time. Take the New Year as a fresh start. Make at least a modest change and gain will result (even if you aren’t still doing next November what you start this January). In our personal lives, there are a host of possible resolutions — Lifehack.com lists 50 resolutions for the New Year! No doubt they don’t intend for every reader to adopt the entire list, but there’s no better way to guarantee failure than having too many resolutions. Resolutions require change and who finds that easy? Scaling that back to just a few — hey, even one — seems a better route to success. One pundit proposes resolving in three areas: health, happiness and character. Do something for your health. Do something that makes you happy. Do something to grow your character. Don’t do 50 things; but do something. In our work lives the New Year offers a new start as well. At the end of the year, we stand back to look at how things went. Hopefully the year included successes, but indubitably some areas are still on the “Needs Improvement” list. Again, there may be some broad categories, and there may even be a long list. Including the entire list in this year’s resolutions isn’t the path to success. Prioritizing that list then picking off the top one or three is a better strategy. And if the categories are broad, drill down. “Pay on time” is a noble goal, but you’re going to have to break that down a bit to find the particulars that can move you in the right direction. 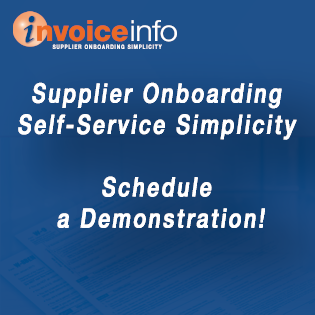 Same with “eliminate paper” – which paper, invoices, checks, vendor information forms? “Improve Vendor Relations” … okay, so what’s something you can start doing now that will move you in that direction? Resolve to do that. Under our broad resolution, what’s a good starting point? Look to see if there’s a “quick win” and resolve to do it. If you already got the most accessible wins last year, then tighten the straps and go after the next, harder thing. The key to achieving your resolution, whether personal or professional, is specificity. A common reason our resolutions fail is that they are too general. Or at least, we fail to take them from the general to the specific. “Get healthy” or “Improve Vendor Relationships” may be fine resolutions but exactly how do you go about them? A Forbes piece on the topic suggests instead of making resolutions, we should set goals. That’s another way to say essentially the same thing. Goals, to be achieved, must be specific. Putting specifics behind a resolution gives us actual steps to take, with a particular outcome in mind. Break it down. We may want to make the initial outcome modest while exactly in line with the larger goal or resolution. Then determine to achieve that first step. Once done, we take the next step. If at some point “life happens” and we don’t get to the final step by the end of the year, we nevertheless have taken some steps and are in a better position than we were (hence, the counsel to make resolutions even if we fail to achieve them). That’s progress. So, here’s to the New Year and your resolutions for it, be they personal or professional — may we all see success! To learn how Financial Operations Networks’ vendor inquiry, onboarding, and compliance solutions can benefit your operations and your company, click here to request more information or call (678) 335-5735.